The Government is in denial. It has ignored calls for an independent public inquiry for a decade. The Committee’s recommendation was dissented from by its Labor member. The Minister for Education asserts there is no problem – ACT schools are doing very well, she says. Meanwhile, the Greens as junior partner in the Government are mute. The results for Year 12, the OECD’s Programme for International Student Assessment (PISA) and NAPLAN all indicate that disadvantaged students are not well-served in ACT schools. Completion of Year 12 is a minimum standard of education in today’s world. It is a key national goal for all governments, including the ACT Government. However, only 51% of low socio-economic status (SES) students in the ACT complete Year 12 − an absolutely appalling outcome. It is the lowest in Australia except for the Northern Territory and 25 percentage points below the national average of 76% [Chart 1]. There is also high inequity in Year 12 completion. Completion rates for medium and high SES students are 85 and 83% respectively, over 30 percentage points more than for low SES students. 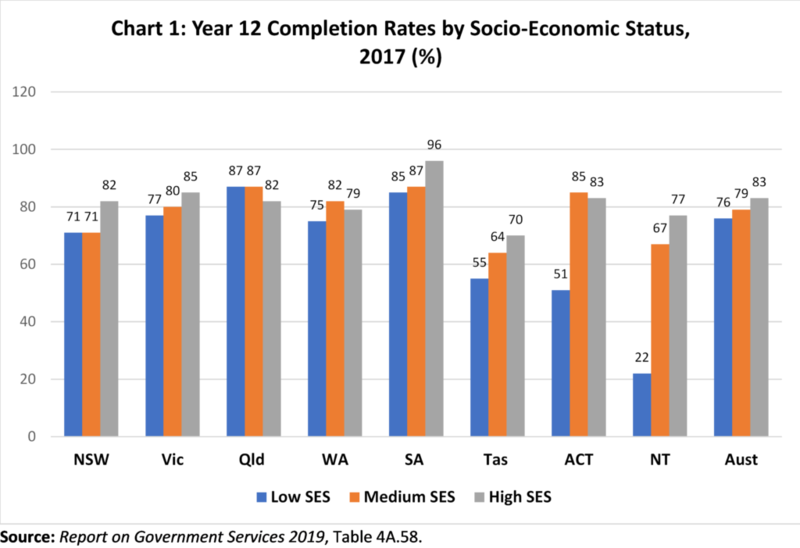 The gap between low SES and other students in the ACT is much larger than in any other state except the Northern Territory. The latest PISA report shows a much greater impact of socio-economic background on student performance in the ACT than any other state and, indeed, the 56 countries participating in PISA 2015 for which data is available [PISA 2015: Reporting Australia’s Results, Ch. 6]. The difference in results between low and high SES students was significantly higher in the ACT than in any other state. The most disadvantaged students in the ACT had lower results than similarly disadvantaged students in every other state except the Northern Territory. The NAPLAN results show no statistically significant improvement in reading, writing and numeracy for Year 9 students of parents with no Year 12 Certificate since 2010 or for Year 9 Indigenous students since 2008. There are large gaps of two to four years of learning between students of parents with a university degree and those with no Year 12 Certificate. The gaps are similar for Indigenous students. The scores and gaps have been volatile over the years, which likely reflects the high degree of statistical uncertainty associated with these results. Year 12, PISA and NAPLAN results also all suggest significant under-performance by ACT schools in the light of the advantages of the ACT compared to other states. Average income and parent education levels are higher than elsewhere. The proportion of low SES students in ACT schools is about half that of other states and there is less extreme poverty. About 40% of ACT students are high SES which is much larger than in any other state. All schools are in the metropolitan area; there are no remote area students. These advantages should generate much better results than elsewhere, but they don’t. 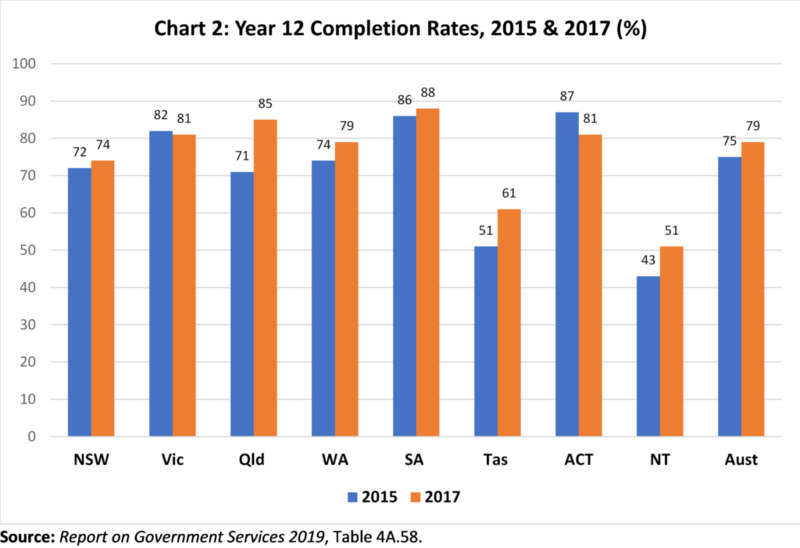 Year 12 completion rates in the ACT are falling while increasing in the rest of Australia. The ACT rate fell from 87% in 2015 to 81% in 2017 while it increased in the rest of Australia from 75 to 79% [Chart 2]. The ACT rate was the highest in Australia in 2015 and 12 percentage points higher than the Australian average. Now it is lower than in South Australia and Queensland, equal to that of Victoria and only slightly higher than the Australian average. 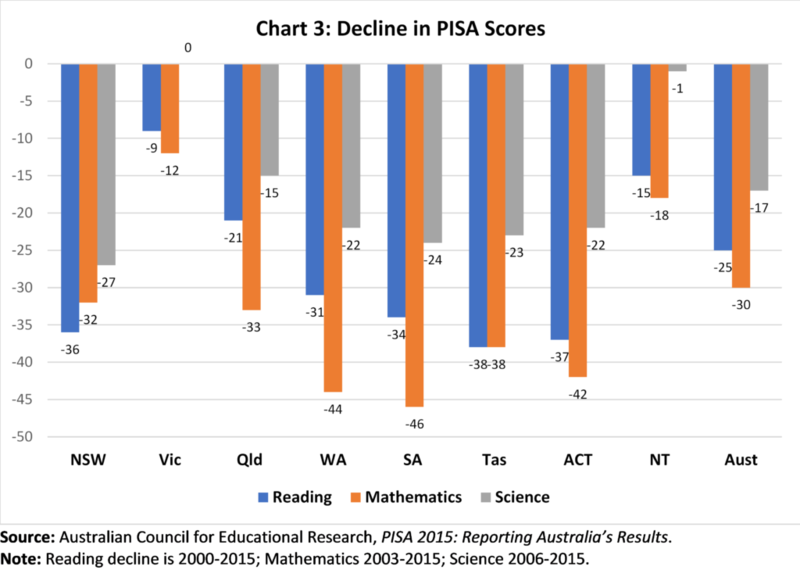 PISA results for 15-year-old students have declined dramatically over 15 years in reading, mathematics and science with a loss of over a year of learning in reading and mathematics. The ACT had amongst the largest declines in the country [Chart 3]. 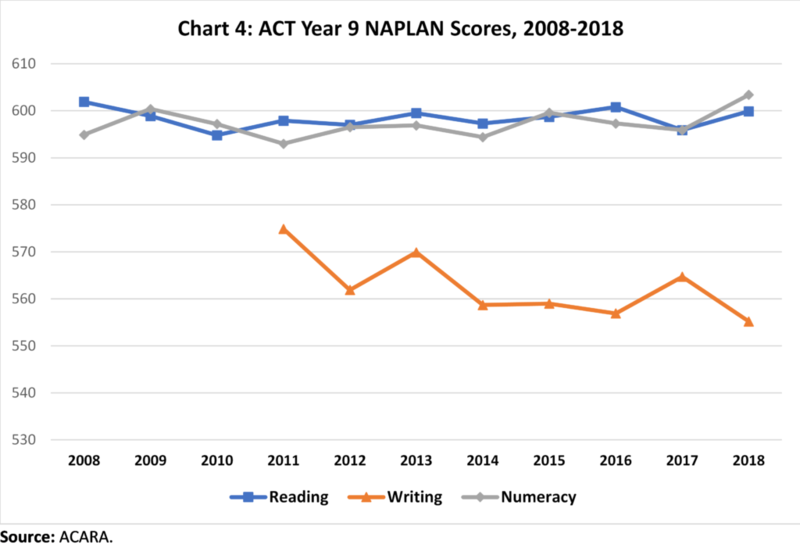 Year 9 NAPLAN results in reading and numeracy have flatlined since 2008 while writing has fallen significantly since 2011 [Chart 4]. ACT results are not statistically different from the Australian average in writing, spelling, grammar and numeracy [Table 1]. Apart from reading, the ACT results are no better than several other states. For example, writing is no better than NSW, Victoria and Western Australia. Numeracy is no better statistically than NSW, Victoria and Western Australia. Spelling and grammar is no better than NSW, Victoria, Queensland, Western Australia and South Australia. It could be that the PISA and NAPLAN results are affected by low student motivation because there are few individual consequences attached to them. Certainly, there is international research and domestic anecdotal evidence of this. However, the PISA and NAPLAN results in the ACT are broadly consistent with Year 12 results which have very real consequences for future careers and lives. Despite the poor outcomes for disadvantaged students, the large achievement gaps between rich and poor and general under-performance, the Minister for Education insists it’s all hunky dory. It is a classic ‘head-in-the-sand’ response. There is no evidence that teaching quality in the ACT is any less than in other states, so we must look elsewhere for the causes of the failure to address disadvantage in education and the general under-performance. This should be a key task of a public inquiry. Severe funding cuts since 2009 have likely contributed to the poor performance. About 80% of disadvantaged students in the ACT attend public schools. Since 2009, funding for public schools has not covered rising costs with the result that the real resources in schools were cut. 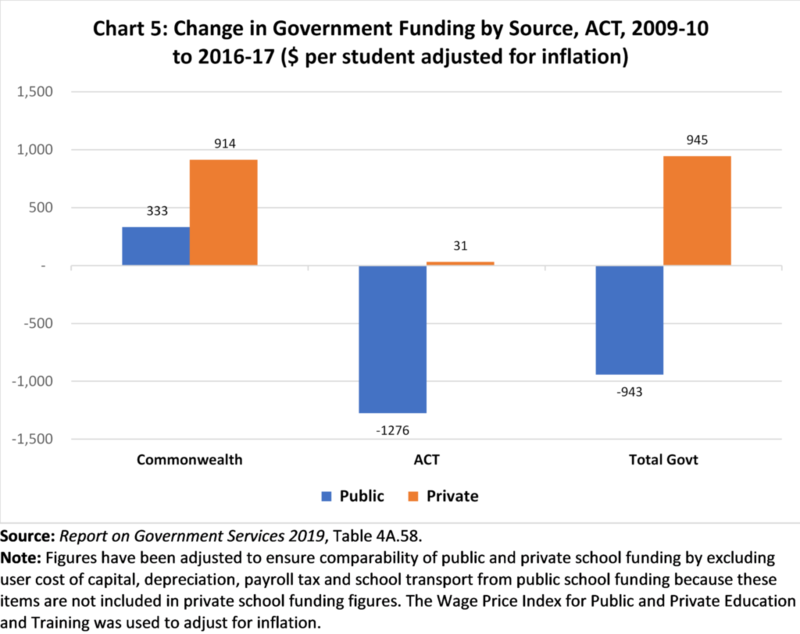 Between 2009-10 and 2016-17, ACT Government funding (adjusted for inflation) for public schools was cut by $1,276 per student and was only partially offset by increased Commonwealth funding so that the overall cut was $943 per student [Chart 5]. Public schools face further cuts under the new bilateral funding agreement signed by the ACT and Commonwealth Governments last December. In contrast, funding for private schools increased by $943 per student – $914 by the Commonwealth and $31 by the ACT Government. The ACT Government implemented a huge cut in its funding of public schools yet maintained its funding for private schools. This is a clear policy failure given the small proportion of disadvantaged students enrolled in private schools. The ACT has to do better. Low education achievement by a significant proportion of young people has far reaching individual, social and economic costs. It stunts individual lives and it brings higher health, social welfare and crime costs. It also stunts economic growth and prosperity. The ACT is a knowledge-based economy dependent on education improvement for its prosperity. An underperforming education system means an underperforming economy and endemic social problems. It is time for the Government to stop defending the indefensible and conduct an open, public review of ACT education performance, including the funding needed to improve the results of disadvantaged students. As a partner in the Government, the Greens should stop lying doggo and use their position to force a review. They should stand up for disadvantaged students and the community, not cower in the background on this crucial matter.